To make Chinmaya Vision Program – a dynamic movement, CCMT Education Cell had organised a two and half day’s “Master Trainer Program - I” for the CVs of Tamil Nadu. The aim of this workshop was to create an in-house dynamic Master Trainers who will make CVP implementation a CVP movement. 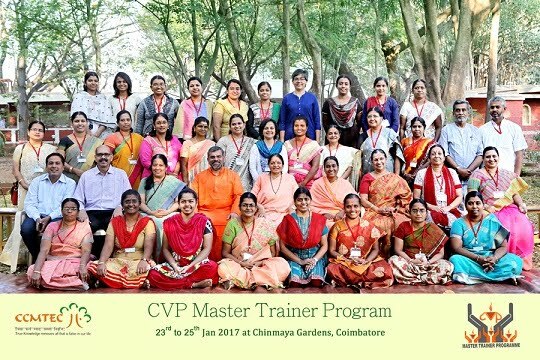 The workshop was organised from 23rd Jan to 25th Jan 2017, wherein, 32 members including Principals, Vice Principals and Senior teachers, already having an understanding and awareness about CVP, attended the program. Swamini Vimalanandaji made a real difference by giving us a true insight on CVP, where Swamini Amma asked us to first make CVP as MYP (My Vision Program). Swami Anukoolanandaji, enhanced our understanding on the implementation of CVP in various areas and also the programs organised by CCMTEC. Smt. Shanti Krishnamurthy (CVP Director, Principal, CIRS) elucidated the roles and responsibilities of the Master Trainer and beautifully guided us by giving clarity on writing the CVP report. Smt. Rajeshwari, connected CVP with the Chinmaya Mission Pledge and CV song and also gave the overview of all the Ghoshtis and Sangams organised by CCMTEC over the years. Each participant was given about 8 minutes to present a topic connecting CVP with the curriculum. It was a very beautiful learning experience for all.